32 by 6 by 1 1/8 in. 81.3 by 15.2 by 2.9 cm. 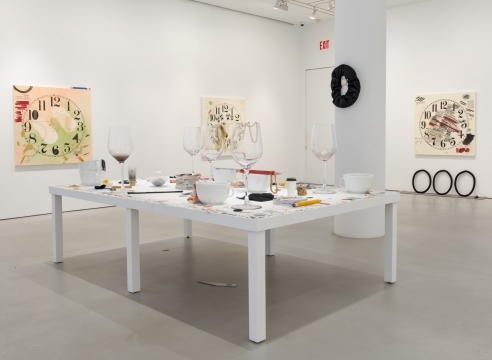 Ross-Ho’s distinctive and diverse practice broadly engages material culture and artifacts of everyday life and work. 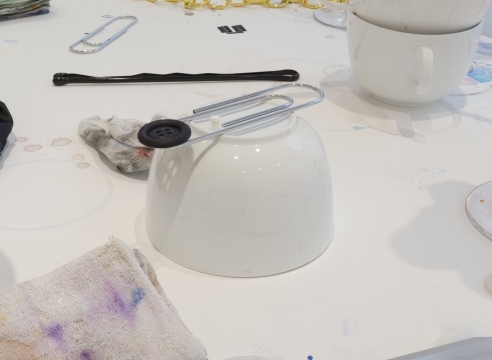 For over a decade, her work has explored the ecology of the studio as a primary subject, engaging it through close forensic examination and reflexive call and response. Past works have imported the architectural entirety of the studio into galleries and museum spaces, enacted meticulous theatrical reenactments of authentic activity, and systematically amplified humble artifacts into monuments. 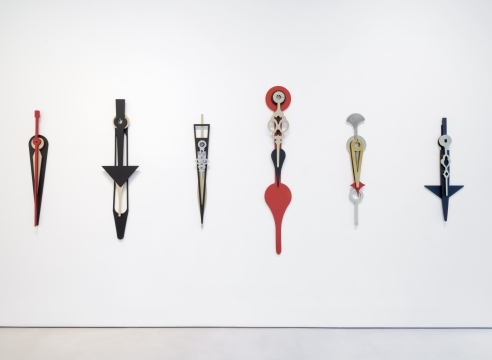 The use of scale shifting has also featured prominently in Ross-Ho’s work for many years. Utilizing it as a hyperbolic device to de-stabilize continuity alongside gestures of subtlety, her use of scale finds root in her formative experiences in photography, performance, and prop-making. 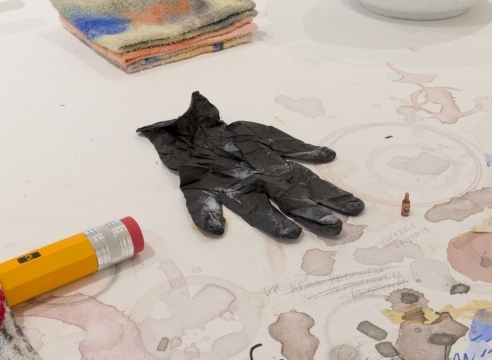 For Ross-Ho, scaling is a method of describing intimacy through what she calls a sculptural ‘close up’ as well as understanding objects anatomically through theatrical and forensic recreation. Last summer, Ross-Ho lost the lease on her Downtown Los Angeles warehouse studio of nine years, and was forced to put its contents into storage. 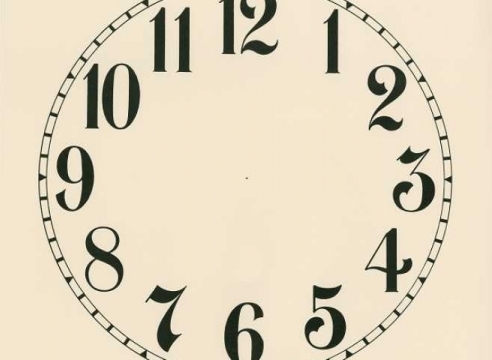 Around the same time, she found a collection of vintage paper clock face dials on Ebay, being liquidated from a clock maker. 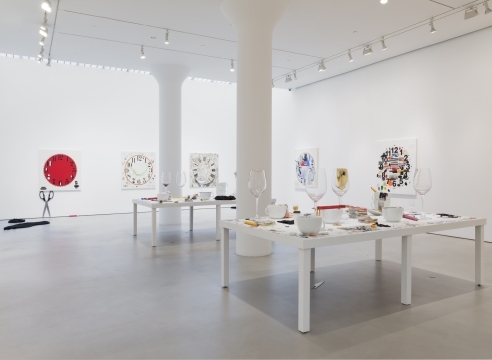 Amputated from the mechanism and components that comprise their intact timepieces, the blank clock faces suggested a poetic potential and a vacant stage for activity. 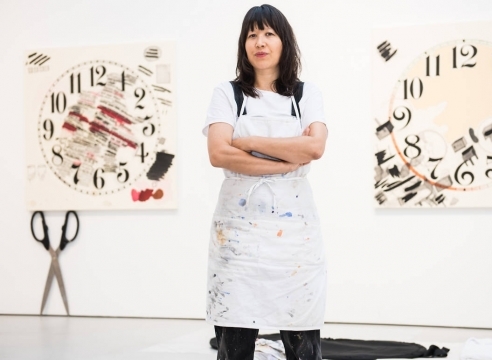 She bought them all, and to mitigate her studio transition while also maintaining a heavy exhibition and travel schedule, Ross-Ho began directly using the paper clock faces as work surfaces, which evolved over the course of a year as she spent time in in airplanes, hotel rooms, Airbnb apartments, as well as her own kitchen table. 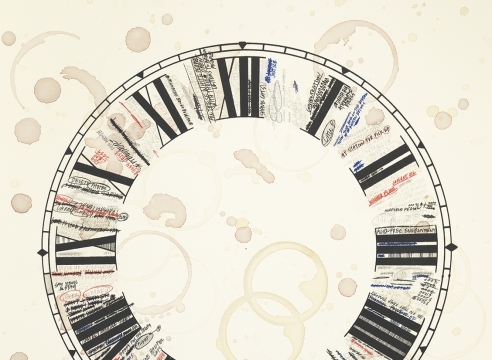 Over the course of many months, doodles, calculations, diagrams, lists, notes to self and other anxious scribbling—combined with the residue of her consumption of food and drink—aggregated on the surfaces of the clock faces. 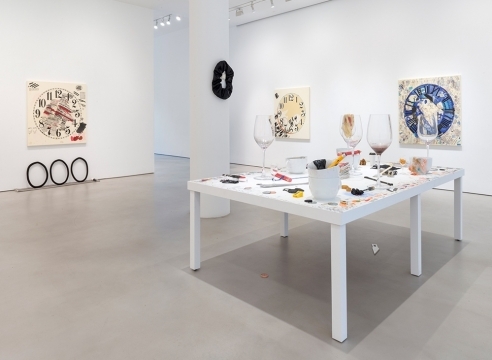 The resulting layered surfaces, dense with the recording of her daily activities of life and art, supplant the movement of a timepiece's usual mechanisms, and present a physical recording of the passage of time within the circuitry of a frenetic mind. 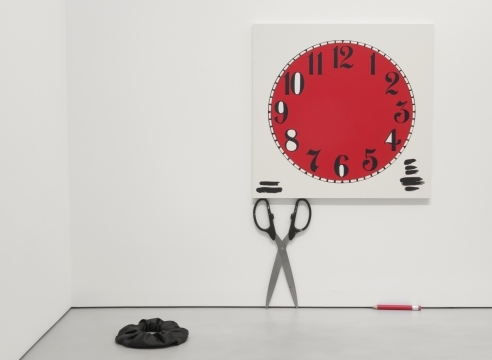 Rather than simply exhibit the clock faces as primary works, Ross-Ho will treat these works on paper as studies or rehearsals for a performative production to take place onsite in Mitchell-Innes & Nash’s gallery. 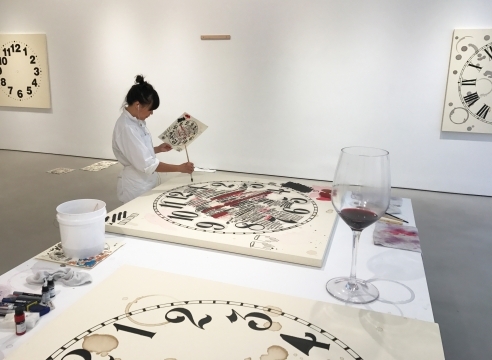 Throughout the month of August, Ross-Ho will import a studio environment into the gallery, translating twelve of the clock works on paper into large-scale paintings produced in real time. By accelerating a year’s worth of work into a month, the performance is an act of compression, collapsing chronology as well as the environments of production and presentation. The result will be a hybrid installation consisting of the authentic residue of work, and the theatrical amplification of many of these same artifacts. 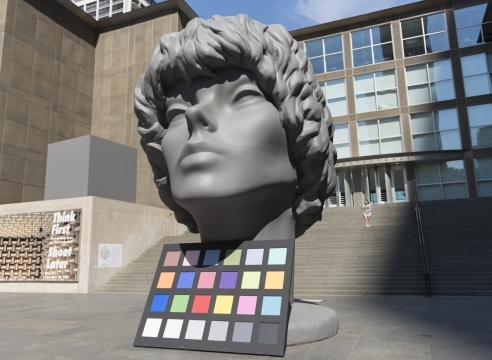 In addition to an assortment of specially fabricated objects that will be incorporated into the installation, the exhibition will also include oversized everyday objects that are already available in the marketplace, typically used as props or sold as ‘gag’ gifts. 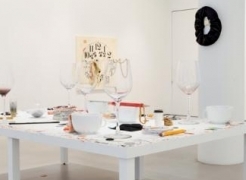 The use of oversized readymades is new for Ross-Ho, complicating her own visual language of scaling by looping her own production tendencies back to the existing mass-produced world of ‘novelty’ objects—calling attention to the circular and overlapping nature of all cultural production. The title MY PEN IS HUGE derives from the bawdy novelty T-shirt design popularized sometime in the late 70’s or early 80’s. Its braggadocios yet feigned arrogance through juvenile wordplay could be a regressive look backwards, or sadly, a timely snapshot of contemporary American life, in which scale, power, and true meaning are all mutable constructs. 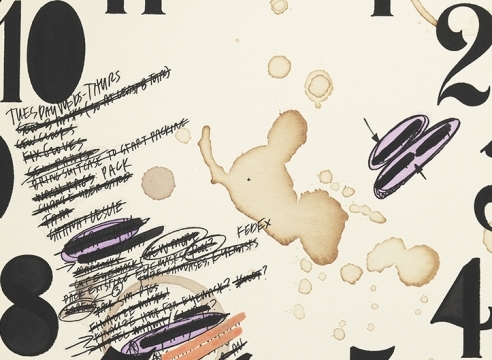 By reclaiming and rewiring the power dynamic of this phrase, Ross-Ho takes back the pen, underscoring the heroics and fallibility of her own mark making.